Connecticut chef Bun Lai is already known for his Mexican grasshopper dish and his fried rice with meal worms and crickets. But he might soon also be recognized as the cicada chef. 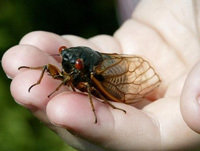 Lai, owner of Miya’s Sushi, tells the New Haven Register that he plans to fill a big freezer full of Brood II cicadas, once the red-eyed bugs’ 17-year life cycle brings them above ground for about five weeks. He plans to feature the cicada in some theme dishes, steaming some of the bugs and boiling others, with the appropriate spices and herbs. “I don’t want to take something that’s inherently nutritious and deep fry it,” he explained. Lai tells the Register that he sees it as a challenge to take something that’s abundant and nourishing and make it appealing, not to mention tasty. Mixing construction equipment with gourmet cooking, two Belgian entrepreneurs are trying to elevate haute cuisine. Their effort began here as a stunt six years ago, when publicist David Ghysels and crane specialist Stefan Kerkhofs seated 22 people around a chef and hoisted everybody 180 feet into the air for a meal. 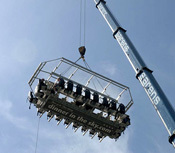 Today, the Dinner in the Sky franchise has tables dangling in more than 40 countries, serving about 1,000 people each month. “It’s just a table hanging from a rope,” says Mr. Ghysels, who has been surprised at the entertainment possibilities of extremely conspicuous consumption. Now, having demonstrated that certain people around the world will fork over up to $500 apiece to dine strapped in like babies in car seats, the Belgian duo are trying to outdo themselves with acrobatic catering. Their latest brainstorm: cocktails served by tightrope walkers. But finding spinoffs that fly can be tricky. Marriage in the Sky “seemed great on paper” but flopped with Europeans, who balked at spending $15,000 for 20 guests, says Mr. Ghysels. He hopes the concept will take off with adventurous Americans or perhaps in India, where it could serve as one element of lavish, extended wedding ceremonies. Some meals can become nail-biters. When the team dangled a musical duo to serenade a nearby table of elevated diners, the piano player got scared that his bench would slip off the airborne stage, recalls Mr. Ghysels. But he calmed down. Diners who have experienced Dinner in the Sky events say it works best in locations with great views. As with expensive restaurants, location is critical. Dinner in the Sky has run meals with breathtaking views of Rome, São Paulo and Sydney, which help if the novelty of elevation wears off. “I’ve never heard anyone say, I’d really like to dangle from a crane and be fed,” says Scott Kennedy, co-owner of a sushi restaurant in Delray Beach. 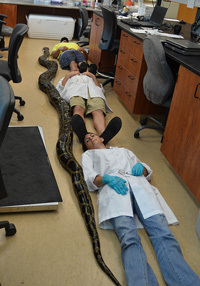 “It’s a cool experience,” he says. But “Delray Beach is not the prettiest city. And at night you can’t see the ocean because it’s pitch black.” His ideal location is Las Vegas. The owners of Victoria’s Wedding Chapel in Las Vegas agree, which is why they are opening a permanent installation under franchise in a few weeks. “It totally fits Las Vegas,” says spokeswoman Jennie Hendricks. In the city of nonstop glitz, nobody questioned the idea of two tables going up and down, offering eight “flights” a night, she says. Other questions did arise. “A lot of people ask how do you go to the bathroom,” Ms. Hendricks says. The trip requires lowering the whole table, which takes about three minutes. “We strongly encourage people to go beforehand,” she says. And an area on the ground below the table is kept clear in case a diner drops a fork. From GrindTV and The Wall Street Journal.